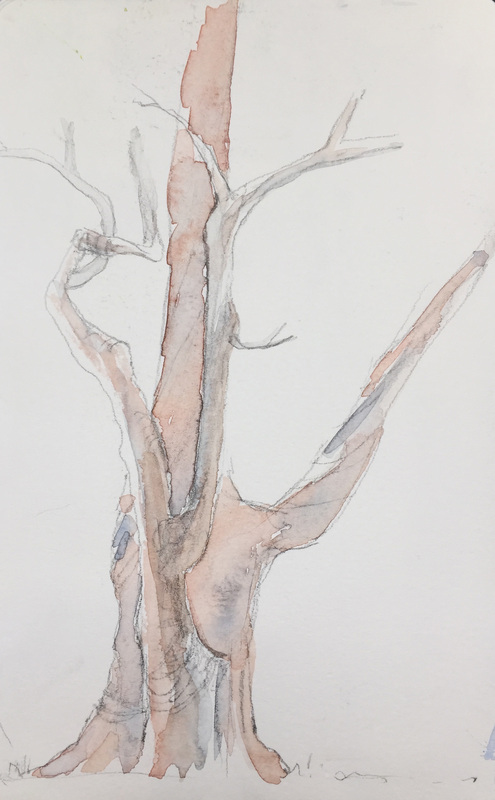 I made this quick water color sketch of a very old eucalyptus in the panhandle of Golden Gate Park a couple of years ago. The bark is amazing; so hard to capture all the nuances of color and pattern. And those twisting branches. I’ll keep trying. This entry was posted in arts, plants, trees/urban forest and tagged art in golden gate park, trees of golden gate park. Bookmark the permalink. Gorgeous as always. you may feel to not have gotten all the tiny shadows, color and bark textures, but you got a lot of beauty! thanks for sharing your world!! I too love the bark of the eucalyptus. So you have company. Me too. We also have the Madrone trees doing the interesting bark quietly. I hope your work helps others to see the beauty of eucalyptus.